Bin is broken and cracked. I no longer use my bin. I use my own container. How many bins do you need picked up? 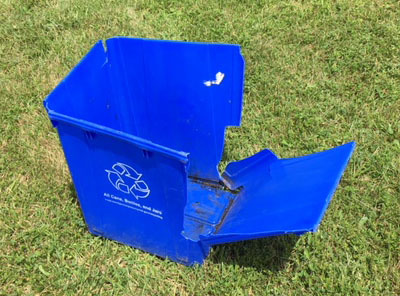 Have a broken or unneeded blue recycling bin at your home? Add bin pickup to your "Cart". We must have a specific pickup request in order to take your old bin. Set your blue bin at the curb upside down and empty next Monday morning by 7:00 a.m.
Leave the bin at the curb. The pick-up will occur when delivery personnel are in your neighborhood. If you ordered a new bin at the same time, we will pick up your old bin when we deliver your new one. When will you pick up my bin? Blue bin pickups are made by County staff, not by your recycling collection crew. They may happen any day of the week, and not necessarily on your recycling day. What happens to the blue bins we pick up? We send broken blue bins we collect from residents back to the bin manufacturer for recycling.